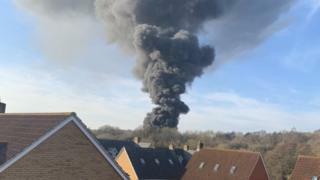 Billowing smoke from a large fire in Bristol could be seen for miles around earlier on Sunday. Avon Fire and Rescue Service told Bristol Live that the fire broke out on the Bridge Road Industrial Estate in the Staple Hill area of the city. Fire service manager Steve Imrie said the fire involved a number of empty containers. He said no-one was on the site at the time the fire broke out. Crews are now damping down at the scene. One eyewitness, Paul Masri-Stone, said: "After seeing how thick and dark the smoke was we headed to the cycle track. "There were six fire engines at the industrial estate by the cycle track by Rodway Common. "Police were condoning off the area and asking people to keep back." On Twitter, Alana Scott said she too saw flames while walking down the cycle track in Mangotsfield. Sasha M described it as "a massive fire".